recommended polarizing filter for visual use. The problem with this filter is that it doesn't screw into my eyepiece barrels very well. I was wondering if anyone has any recommendations for polarizing filters for visual use. I note that virtually all my other two inch eyepieces have accommodate my variety of two inch filters OK. I think the issue here is the 2002 Orion threads. I see there is a fancier Alpine-Astro Baader version of the variable polarizing filter. But I was thinking maybe there is a one filter polarizing option that is not to bright and not to faint. It seems to me that I use the one I have in one position, implying that a non-variable polarizing filter might do the trick, if I knew which one to get. Edited by gnowellsct, 25 March 2019 - 02:41 PM. A single polarizing filter, if made correctly, should be about the same brightness no matter who makes it, except circular polarizers which are designed primarily for cameras with CMOS/CCD sensors due to the problems using standard polarizing filters with their type of light meter sensors. Anyway a variable polarizer is made up of 2 identical filters that you can rotate to change the amount of light that gets to your eye in this case. Other than the quality of the glass you can use any 2 of those filters from anyone and make a variable polarizer. They don't even have to be the same size so you could put one on the end of your diagonal if its threaded and one on your eyepiece or your 1.25" > 2" adapter if its threaded. Only thing that matters is what part you need to rotate in the rear to get the effect you want. Some people mistakenly think the filters need to stacked on top of each other. they are used that way in cameras because there is only one place to mount them on the end of the lens so those types are actually stacked in a single unit where only the outer one rotates. In a telescope you have options on where to mount them depending on what parts have the correct threads in them. And many things that appear to have threads really don't as sometimes they are just mini baffles to combat stray light and sometimes they are the actual threads in the barrel that the lens retaining rings screw into. Not truly correct filter threads. Just depends on when they were made. Many things were initially made without filter threads at all and were added later as production of the item picked up. "I think the issue here is the 2002 Orion threads." The Toya variable polarizing filter works very well both at the threads of a 2" EP and the threads of the diagonal. These are made in Japan. I use the Toya VP filter when observing Sun with the SCT in WL , helps tone down the brightness of the baader visual film and makes it easier to observe granulation of the photosphere. Also like the Toya filter to observe the Moon before the sky gets fully dark, you can give a little twist the bottom of filter and the sky turns black and shows more contrast of Lunar features. This is all good to know. 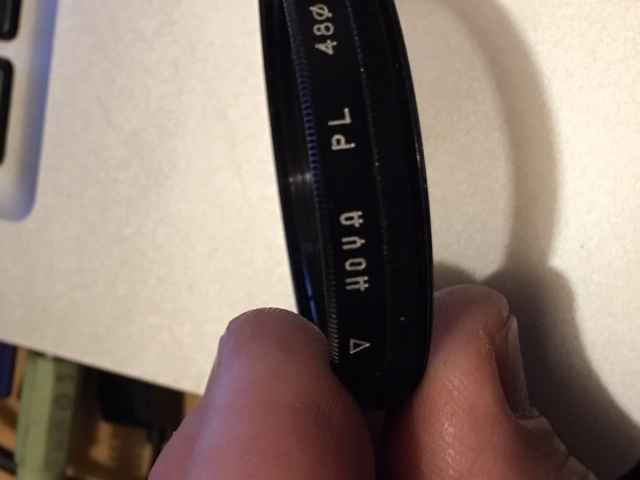 I'm not getting any hits on Toya variable polarizing filter so it looks like Baader unless someone has a better idea? Or a link? Has anyone compared the Toya to the Baader? I guess I'm also wondering whether Orion cheaped out on this filter or whether they're sort of impossible to get wrong. p.s. as a side note back in the early 00s Meade filters did not fit everyone else's oculars. I don't know if that is still true. Edited by gnowellsct, 25 March 2019 - 05:11 PM. Sorry there , correction HOYA , not Toya!... My bad. I found a few in 52mm and a link for a 48mm but out of stock there. The listing says 48mm but product description indicates is 49mm. That would be a no- go. I'll keep looking . Edited by Stardust Dave, 25 March 2019 - 08:03 PM. This guy says polarizing filters bite big time! I guess I'll try to see what comes up at NEAF. The issue of variable threads and what-is-that-on-ebay makes me lean to Baader as a proven entity, unless I can find an established vendor. The price is....interesting, to the point of making one cautious. It's like those svbony oculars. There is such a thing as TOO inexpensive? Edited by rolo, 27 March 2019 - 07:00 AM. I'm wondering about just getting a single polarizing filter. Astro-physics sells them in 1" and 2" formats. They say they must be used with a diagonal. Couldn't one just screw it in to the quark etalon's threads and just rotate the etalon for optimal view? There would be a diagonal in front. They're not expensive as far as these things go. I actually would prefer NOT to have a variable filter unless there is a compelling reason to do so. What I have found is that there is one optimal position (for me) and I just wish I had a filter which went to that position. The two inch could also be threaded on to a 1.25" to 2" adapter. (PMDMAX), or the Hershel Prism (BPHERP) to achieve the polarizing affect. or the Hershel Prism (BPHERP) to achieve the polarizing affect.